Some Boots pharmacy staff say they are under too much pressure and fear mistakes will be made. One whistleblower, a former manager, said he resigned in 2015 after he took his concerns to the independent industry regulator. Several current Boots pharmacists told BBC Inside Out that understaffing could pose a risk to patients. But the chain said its pharmacies were not understaffed and it had an industry-leading patient safety record. Greg Lawton, who worked for Boots between 2008 and 2015 and in his final role was part of the manpower planning team that assessed staffing levels in the company's pharmacies, said the things he knew about staffing levels kept him awake at night. In 2012 he worked on an investigation ordered by Boots into stores with the highest levels of dispensing errors. "We spoke to pharmacists, to store managers and to area managers and what those people were saying [was that] absolutely staffing levels was flagged as an issue, poor staffing levels," he said. Boots said that after the investigation it implemented a detailed action plan. It then commissioned academic research which, it says, found that pharmacies with higher levels of dispensing staff were associated with higher error rates. In November 2012, a woman called Arlene Devereaux died on her 71st birthday after a Boots pharmacy in Chesterfield dispensed six times the strength of morphine tablets prescribed by her GP. While understaffing was not found to be a contributing factor in her death, Mr Lawton said: "It was shocking and it kind of reminded you of the importance of the job that you were doing and strengthened your resolve to try and make a difference." Mrs Devereaux was one of three people to die between May 2012 and November 2013 following dispensing errors by Boots. Douglas Lamond, 86, died in May 2012 while Margaret Forrest, also aged 86, died in November 2013. Staff had not followed company safety procedures, and understaffing was not found to have contributed to any of these deaths. However, the inquest into Mr Lamond's death was told by a member of the pharmacy team that staff at the Boots branch in Felixstowe, Suffolk, had been under pressure as it was "very busy". The inquest in March 2017 heard that staff kept telling their area manager they did not have enough space to do their job. Boots said it found no record of staff raising concerns with the area manager. When police investigated Mr Lamond's death they asked to see the company's own internal investigations report, but Boots refused. Boots was entitled to do this under legal privilege. However, Det Supt Andy Smith, of Suffolk Police, said he felt the company had a moral responsibility. "I do think particularly big corporate companies such as Boots who have a significant responsibility towards public safety have a moral duty to co-operate fully with any police investigation, and also they have an overriding duty to demonstrate transparency to the family." 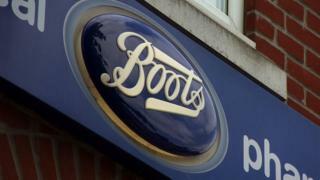 Boots said it co-operated fully with the police and legal privilege allows staff to make full and frank reports. Image caption Det Supt Andy Smith said Boots had "a moral duty to co-operate fully with any police investigation"
In 2014, Mr Lawton had been looking in detail at staffing and budgets and was concerned that pressure from understaffing could lead to serious mistakes. "I was terrified that something bad might happen to a patient, so the patient might be seriously harmed or a patient might die because of the inadequate staffing levels and the pressure that was placed on pharmacists and pharmacy teams," he said. The BBC has spoken to several pharmacists who still work for Boots and have concerns about patient safety. "Some days you would easily describe the team as being at breaking point," said one, who asked not to be identified. "That's because, simply, the amount of work that has to be done can't physically get done safely and it can't physically get done without either working longer hours or working after the store has closed." Another pharmacist, who also wished to remain anonymous, said: "Mistakes may not be picked up on and that could ultimately lead to somebody possibly dying, somebody missing medication, harm coming to people. Small mix-ups really, just one tablet for another tablet." Mr Lawton took his concerns to the regulator, the General Pharmaceutical Council (GPhC), shortly before resigning in 2015. He presented the regulator with a 55-page witness statement based on his experiences and concerns, as well as dozens of supporting documents. In December 2016 it concluded there was not sufficient objective, independent evidence to suggest a risk to patient safety across the organisation. How rare are dispensing errors? Boots told the BBC it dispensed more than 220 million prescription items in the year beginning April 2016. Reported incidents where patients were harmed in some way were very rare - 901, or 0.00041%. Boots says these figures include incidents where a patient was harmed after Boots supplied the correct product. For example, the patient may have suffered an allergic reaction to a medicine even though the medicine was dispensed fully in accordance with the prescription, or there may have been a delay in supplying the medication. Boots says that its analysis indicates it has one of the lowest percentages of errors in the community pharmacy sector where harm was reported. In the year beginning April 2016, 17,000 incidents involving medication were reported to the NHS in England and Wales. That reporting is voluntary so the real figure could be higher. The GPhC told the BBC it inspected more than 2,000 Boots pharmacies between November 2013 and August 2017 and 26 did not have enough qualified and skilled staff to provide a safe service. However, it said they were now up to standard. That means only 1.2% of Boots pharmacies failed on the staffing standard, which compares favourably with all other pharmacies, where an average of 2.4% failed. Boots has almost 2,400 pharmacies and as of July 2017 employed 6,697 pharmacists. However, the firm has declined to explain to the BBC how it works out how many staff to put in each pharmacy, as it says such information is commercially sensitive. Boots said there had been no further deaths directly linked to dispensing errors at its pharmacies since 2013. Its UK pharmacy director Richard Bradley said: "One mistake like this is one mistake too many and my absolute assurance is, despite having our industry leading record, we will continue to focus on minimising the chance of it happening again." The firm said since Mr Lawton left it had increased the number of pharmacists it employed by 430 and the number of pharmacy technicians by over 360. Staff with pharmacy capability has risen by more than 2,400, with staff in those last two groups still in training. "Greg, his opinions and his concerns, [he] left the business over two years ago and [his opinions] aren't relevant to Boots today," added Mr Bradley. "We continue to invest in more people, more pharmacists than ever before, that's into our shops and it's into our processes, helping to make things more safe. "Our pharmacies are busy places but they are safe places. "I'm absolutely confident that the resource is there to deliver the patient care. I am confident that we have enough staff." However, Mr Lawton believes the regulator does not have enough power. "We need regulatory standards to specify what the staffing levels must be in pharmacies," he said. At the moment, the only legal requirement to enforce safe staffing levels is that a pharmacist in charge, or "Responsible Pharmacist", has to be there when the pharmacy is open. Joy Wingfield, a pharmacy law and ethics expert who has trained the last two Boots superintendents - the pharmacists in charge of patient safety - agrees that regulation around pharmacy is inadequate and minimum staffing levels need to be defined. "I'd like to see the powers they [the GPhC] have against corporate employers re-examined," she said. "I don't think that anybody could have envisaged that the employment of pharmacists would devolve on such enormous, large international companies." The regulator said it was providing new patient safety guidance to pharmacy owners later this year which will include explaining what they should do to make sure they have enough qualified staff in each pharmacy. Boots: Pharmacists under pressure? is on BBC One on Monday 8 January, at 19:30 GMT across BBC English regions and at 22:45 in Northern Ireland and Wales. It will be on BBC Two in Scotland at 19:00 BST on Thursday 11 January, on the BBC News channel at 20:30 on Friday 12 January and Saturday 13 January, and at 10:30 on Sunday 14 January.